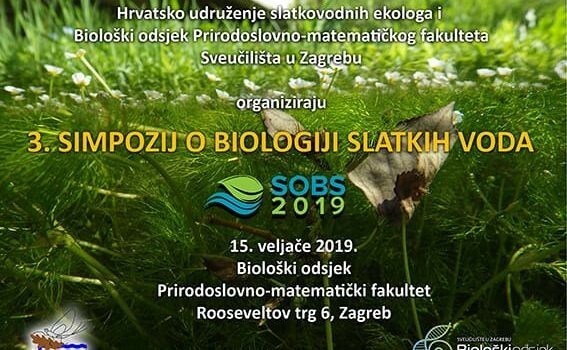 On February 15th 2019, the 3rd Symposium on Freshwater Biology (SOBS) was organized by Croatian Association of Freshwater Ecologists (HUSEk) and the Department of Biology of the Faculty of Sciences of the University of Zagreb. This symposium addressed various topics of biology and ecology of freshwater ecosystems, including aspects of nature protection and the impact of global change and humans on freshwater ecosystems. Plenary lectures were devoted to the various issues regarding intermittent streams and the problems of biodiversity and taxonomy of cyanobacteria. Our colleague, Najla Baković, held oral lecture on the topic of the first data on microorganism on the habitat of the endemic karst subterranean bivalve Congeria jalzici, titled: Protist assemblages associated with the endemic subterranean bivalve Congeria jalzici Morton & Bilandžija, 2013 (Bivalvia: Dreissenidae) (authors: Baković N., Puljas S., Baković R., Ozimec R., Ostojic A., Mesic Z., Hudin S.). She also participated, as one of the co-authors, of the abstract Biodiversity of Lake Crveno jezero (Red Lake) aquatic ecosystem (authors: Ozimec R., Jalžić B., Jelić D., Baković N., Brancelj A., Ćetković H., Gligora Udovič M., Karaman G., Komnenov M., Slapnik R.), that presented the results of the biological research of the Red Lake near Imotski.